Joplin High School has a new name thanks to gaffers tape in Joplin, Missouri on June 8, 2011. The town continues to clear away debris from the devastating May 22 tornado that destroyed thousands of homes and businesses and killed 141 people. Yesterday, the Joplin School Board approved payment of nearly $30 million for the month of July and about half of August. The district's typical monthly bill is between $6 million to $7 million. The Joplin Globe reports that the district is using insurance and Federal Emergency Management Agency reimbursements to help pay the bills. 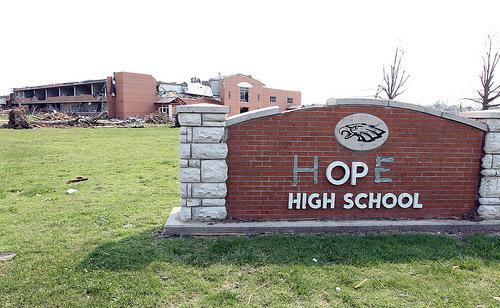 The district's chief financial officer, Paul Barr, says the damage from the tornado reduced the district's assessed valuation by about $24 million. He says that could cause challenges for the district in the future, although the board voted Tuesday to maintain the current levy for this school year. People who live near Smith Creek in the St. Louis suburb of Creve Coeur are being urged to stay away fromthe creek for up to 72 hours following a sewage spill. The Metropolitan St. Louis Sewer District says workers are cleaning up the mess and making repairs after a sewer line broke and leaked sewage into the creek - roughly 215,000 gallons of sewage. No one was hurt and the spill has been reported to the Missouri Department of Natural Resources. Top officials from Missouri's executive, legislative and judicial branches are joining forces for a new effort that could reduce costs in Missouri's criminal justice system. The lineup for a Wednesday morning news conference about Missouri's public safety efforts features Gov. Jay Nixon, Attorney General Chris Koster, Supreme Court Judge William Ray Price Jr., state Senate President Pro Tem Rob Mayer, House Speaker Steven Tilley and Department of Corrections Director George Lombardi. The Associated Press reported last month that state officials were backing an effort to analyze and revamp Missouri's criminal sentencing practices. The effort ultimately could divert more offenders to enhanced probation and treatment programs, instead of more costly prison terms.